Are you getting tired of competing for clients? Are you finding it hard to distinguish yourselves from the other Wealth Management fims? What Do Clients Look for In a Wealth Manager? Just imagine it’s your hard earned money, would you let just anyone manage your money and investments? You would want the BEST money can buy, you would want managers who are exceptionally savvy and understand financial products to the greatest detail. You would want a manager who clearly has your best interests at heart and displays the credibility and authority in wealth and investment management. You have clients coming to you instead of you prospecting for clients. Clients are coming to you because they feel you are the ones equipped with the expertise they’re looking for to manage their money. That’s what the Certified Wealth & Investment Specialist (CWIMS) designation gives you. Unlike any other Wealth Manager, you’ll have a certificate AND badge to prove your Wealth management expertise from a source that is trusted by global businesses – which is what REALLY counts. More importantly, it will make you a better Wealth & Investment Professional. Have peace of mind your Wealth Managers have a standardised level of skills and competency. What makes a good Private Banker / Wealth Manager? Your certification assessment will be based upon an exam and/or project-work. 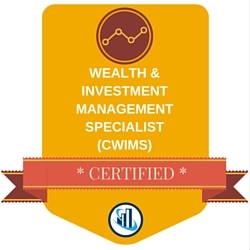 This digital badge designates you as a Certified Wealth & Investment Management Specialist (CWIMS)™, which you may use on business cards, resumes, LinkedIn profiles, website profiles, email signatures and more. In addition to the Certificate of Completion for the course in general, if you successfully pass the Certification exam, you also receive a CWIMS™ Certificate to mark your achievement. As part of your successful certification, you also receive a full year's access to an exclusive Membership library to help you keep up-to-date on industry issues. In order to keep your status as a CRSIA™ in good standing, you need to regularly take Continuing Professional Development courses.